Garmin Forerunner 645 Music: with phone-free music, 7-day battery and more advanced fitness features than you can shake a relay baton at is this the ultimate running watch? Garmin already rides high in our list of the best running and gym watches, taking the top two slots. Its latest, the Forerunner 245 Music could do even better, potentially becoming #0 on the chart. Think that's how it works. The Forerunner 645 Music takes the many, many features of the Forerunner 235 and adds music playback without the need for a phone, with either 'up to 500 tracks' stored in its memory, or access to offline Deezer Premium+ playlists, similar to the feature recently introduced to the Fitbit Ionic. Just add a pair of Bluetooth headphones and hit the road. Also matching the Ionic, the 645 Music gets contactless payments, although that's not much use to those of us in the UK as Garmin Pay doesn't support any UK banks as yet. Those are really just the fancy icing on the top of the usual Garmin Cake of Excellence. If all proceeds as normal with Garmin's devices, the Forerunner 245 Music will boast accurate and fast GPS tracking, reasonably accurate on-wrist pulse tracking, and data harvesting that varies from merely in-depth to, with the addition of a Garmin heart rate strap or foot pod, vaguely insane (cadence, ground contact time, stride length, that sort of thing). Garmin's unwieldy but feature-packed app then offers "performance monitoring tools, connected features and thousands of ways to customize with free watch faces, widgets, data fields and apps through the Garmin Connect IQ store." Also bringing the 645 Music more in line with Fitbit's Ionic, the look gets a slightly more stylish update, with a metal bezel, new, always-on Garmin Chroma Display that is said to be easier to read in direct sunlight, "chemically strengthened glass" and interchangeable bands. 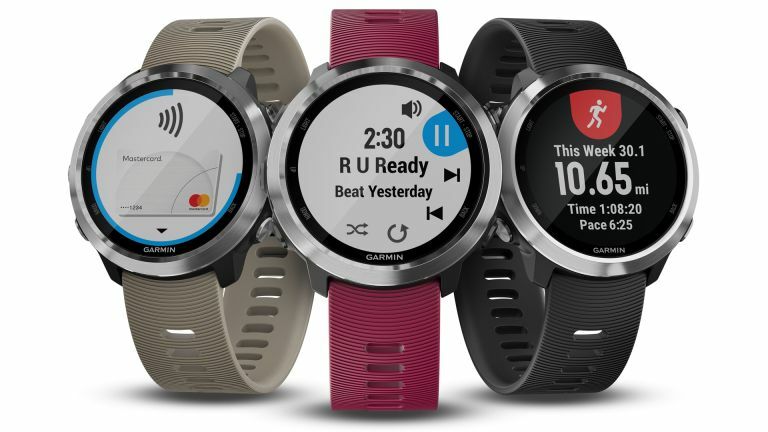 Developing features tried on Garmin wearables before, a new tie-up with fitness data wranglers Firstbeat means the watch/app will now "automatically evaluate previous exercise and fitness levels to let you know if you are training productively, peaking or overreaching." Firstbeat's system takes data from the last seven days to determine if your workouts are too easy, too hard, or 'just so'. Aerobic and anaerobic training effect metrics, as found on the high-end Forerunner 635 watch, give an indication of how your workouts are improving your fitness. Available with a black or cerise band, the RRP of £399.99 means the Forerunner 245 is considerably more expensive than the Fitbit Ionic, but then it offers so much more for really keen runners and other fitness enthusiasts. The Forerunner 645 – the same thing but without the music player – is £349.99 and comes in a choice of black or sandstone band.